Sewer backup in your home can quickly become a health and safety hazard, and lead to costly repairs due to water damage. A sewer backup can results from improper drainage or sewer line damage, or from environmental factors, such as heavy rainfall or melting snow. Sewage comes from toilets, sinks and other drains, and can contain a variety of contaminants. Thankfully, there are preventative measures you can take to avoid a sewer backup, or lessen the damage. However, if you’re already experiencing a sewer backup, call an experienced plumber immediately to resolve the problem. Every home is different, so you’ll need to know the location of your pipes, valves and pumps. Don’t flush items like dental floss, flushable wipes, razor blades or any other non-flushable items down the toilet, and don’t pour fat, oil or grease down the drain. You should also contact a plumber to upgrade your drains with modern plastic, which is more enduring than metal. As well, a plumber can perform regular cleaning and upkeep of your drains to prevent clogging. Look around your home for any cracks in the perimeter and foundation, such as in the walls or floors. Clear off any downspouts or eavestroughs that collect debris. As well, planting native plants around your home and using porous pavement will help to absorb rainwater and snow. 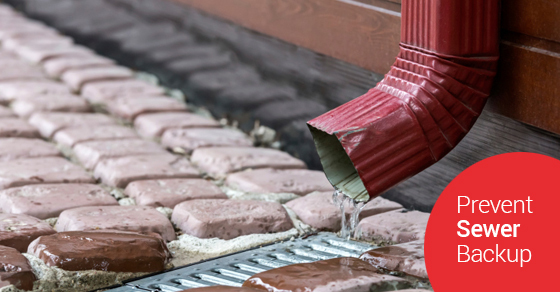 A standpipe will collect any water that rises out of the drain, depending on the depth of the flooding, and can be removed if you feel there’s no longer a threat of flooding. An overhead sewer collects overflow below floor level, and then pumps that water into overhead pipes, eventually draining into the main sewage line. This is the most costly option, and will require an experienced plumber, however it is one of the most effective. A backwater valve is typically installed in the basement and connects to sewer lateral, which is often the closest manhole. Backwater valves prevent sewer water from entering your home, and ultimately damaging your flooring, walls and furniture. Depending on your property, an experienced plumber can install the right backwater valve for you. Keeping these tips in mind will help to mitigate the risk of a sewer backup, and lessen the damage in the event of a backup. However, a sewer backup shouldn’t be taken lightly. The resulting damage to your home, and the possible health hazards, is significant. If you require maintenance of your plumbing system, or are currently experiencing a sewer backup, call an experienced plumber.